The Cash Bandits Slots Game - New 2016 Bonus Helps Rob The Bank! In 2015, one of the hottest games for Wins and Free Spins in the words of slots players was Cash Bandits. With so many games on offer throughout the year this one could easily have slipped under your radar, so here's a chance to find out what it is all about, and get 2016 off to some fast paced action and fun! 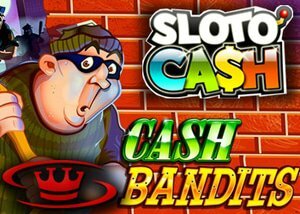 Cash Bandits is a 25 payline slots game played over 5 reels and features a theme that allows players to be the one on the run with bags full of cash! You'll have to be on your guard as the cops will soon be in hot pursuit, as you make your way away from the scene of the crime. Crack The Vault And Get Away With The Cash! Hilarity and Hijinks ensues as players fully engage in the theme, and this fun game is filled with colorful characters and getaways along with a great sound track, as madcap capers lead on to the bonus features, and even more lovely cash to add to the haul. Enjoy the spinning of Wilds as there are plenty on hand to increase your winnings, watch for the Scatters that multiply your bets. Revel in the chances to win up to 90 Free Games with the added power of a 12 x Multiplier. Play the special Vault Feature and you'll receive 5 Free Games as a reward with a Free Games Multiplier x 2 that retriggers and adds an additional 5 Free Games to the current featured bonus. Look out for the progressive jackpot too, that can instantly be awarded at the end of any game. Now there's a chance to visit the Sloto'Cash Casino who will reward you for kicking off your New Year with them. Make a deposit as little as $35 and play Cash Bandits for real money, and you'll collect a 100% Bonus along with an additional 50 Free Spins. Land some of the juicy wins available on this exciting popular game right away, with symbols such as the Scatter Cops, the Wild Bank Vault Door, Robbers Badge symbol, Red Getaway Car, Donuts, Guns, Loudspeaker, Bags of Cash and other special features that can be capitalized upon in this exciting Cops & Robbers game. With not one but two random progressive jackpots on hand your winnings could increase dramatically just when you least expected it, grab the bonus money and have fun, this could be your lucky year!